I get a lot of joy watching our bulbs bloom. Part of it is that I actually planted them (gardening is not something I am particularly drawn to), so that they seem to be part of my creation in a way. Another part of it is that they are a symbol of spring and a much-needed lift to the landscape of a hard winter in Kansas. 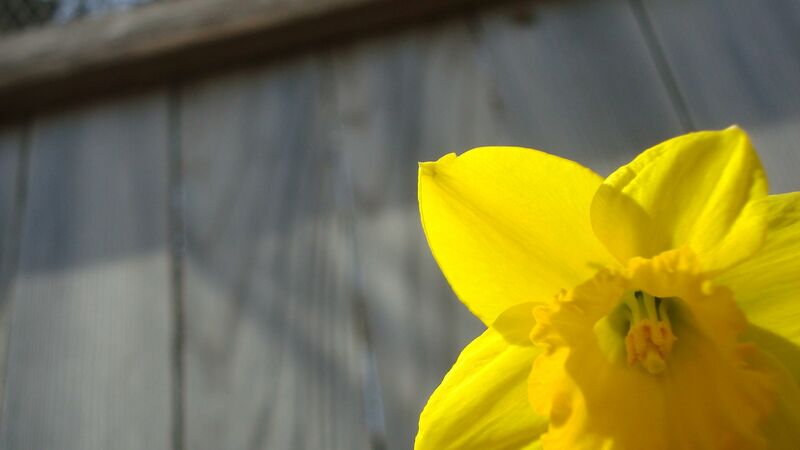 But as I have found myself checking the progress of the bulbs regularly, and now that my daffodils have finally opened, I realize that part of the joy I receive is based on the fulfillment of the anticipation I have built up. Daffodils are my favorite. The crocus, being the first to show, is a boost, but the yellow perkiness has it beat for me. I wondered, what foods make me feel the way I feel when I see those first daffodils blooming in my yard? At first, I couldn’t get beyond the color – the yellowness of lemons: lemon bars, lemon souffle, lemonade. Then other spring vegetables came to mind, like the first tender asparagus sold at the farmer’s market. Then Robert had a wonderful answer when I asked him about culinary applications for the feeling of daffodils. “My first cup of coffee in the morning”, he said. At first I had a hard time seeing the relationship, then it seemed like a brilliant summation of anticipation fulfilled. I suppose it is the same principle that makes ‘playing hard to get’ with other people actually work. When we have to wait for something we want, it seems better. When I have to crack open the shell of a crab leg and dig around for a bite, it tastes better than it would if it were just presented on my plate. Most people don’t wish to actually wait for anything, but I think that I will try to see waiting as an opportunity for increased pleasure when the anticipation is finally fulfilled. Spring Food Anticipation Fullfilled for me: Coconut cake last night. I always crave it this time of year. I prefer it in the shape of a bunny to really feel spring-y. I totally agree with Roberto (I think it only fitting to add the “o” to his name now that he is the proprietor of a latin restaurant!). I also eagerly anticipate my first cup of coffee in the morning. At the risk of sounding like a tragic old woman, sometimes I even find myself thinking about it the night before as I am falling asleep. Now I just need 14 cats and a used kleenex tucked into the cuff of my shirt sleeve and I am “officially” a tragic old woman! For me, the anicipation of 100-year-old trees leafing out in the spring gives me great pleasure. I watch for it all spring as they come back to life. A great cup of coffee in the morning often gives me goose bumbs, but that’s just the hedonist in me. Food is an experience that absorbs my senses in the moment. I love this Molly! For me, spring is officially here when I see the pale purple blooms on lilac bushes, and they inspire me to make May baskets!!! Happy Spring!